Posted in: Pro-line, Radio Control. Tagged: New Releases, RC. Pro-Line has posted the Official Release for their inaugural SCT the PRO-2 2WD 1:10 Short Course Truck Kit and it has been creating some buzz since it was first announced. Comparisons have been made to TLR 22SCT and a LCG Slash and since I happen to have both, I thought I would chime in. I think it is more Slash then Losi, as far as I know, all of the parts will fit on the Traxxas Slash although it is comparable in price to the TLR 22SCT and until I drive one, I will never know for sure. 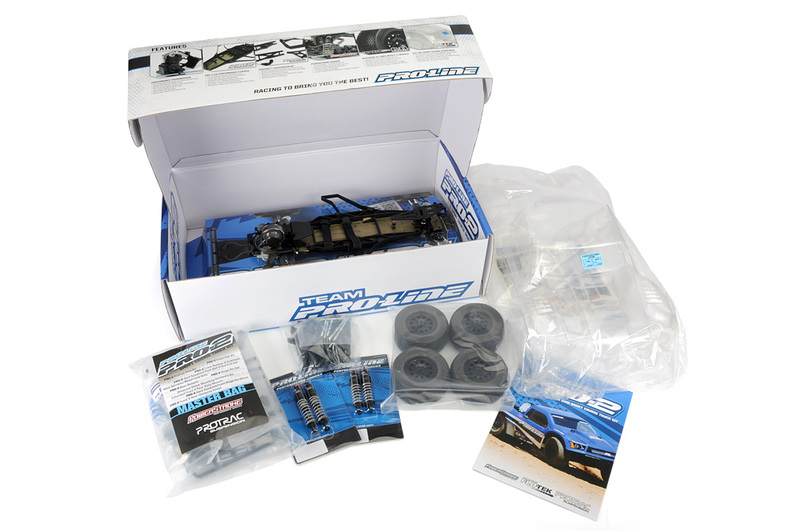 The price point has also raised some concern and the MRSP of $389.95, seems steep, but what we need to remember here is that this kit is made up from all of the parts that you would upgrade to if you upgraded your complete truck with Pro-Line parts. For example, the LCG Performance Chassis itself retails for $127.46 and the Performance Transmission retails $114.71, the Power Stroke Shocks are $53.41 a pair and the Protrac Suspension Kit is $62.01. That total is $411 and you can see why the price isn’t that bad all things considered. You will need to decide for yourself if you believe Pro-Line or any other RC vehicle is worth that amount of money. Don’t forget, you will still need to buy your electronics. At this point, I will be watching this product, but I don’t think I will be buying it, simply because of the price and the fact I already have 2 other SCT’s. I would love to have some first hand experience with one, or hear from somebody that has one.